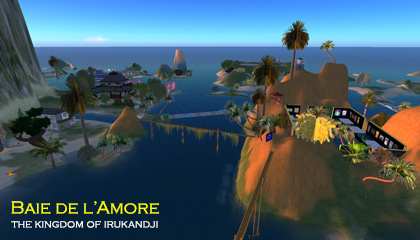 NOTE: This page is about Baie de l'Amore in Second Life. 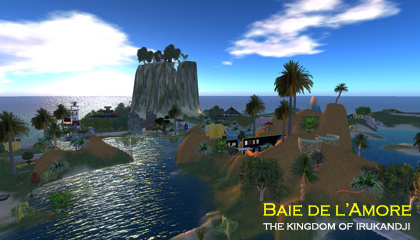 The InWorldz version is here: Baie de l'Amore in InWorldz. The simulator, Baie de l'Amore is a region in Tamita State in central Irukandji. Baie de l'Amore directly abuts Romeo Beach on the northern shore of the capital, Tamita Island. It was the fourth sim that I developed on the Irukandji continent in Second Life, and was designed and landscaped by hand. Baie de l'Amore is an unpopulated deepwater bay with a central volcanic crater called Ragnarok Island. Inside the crater is the Xavier T Gallery, which houses my paintings and drawings, much the same as on this website, except that visitors can walk through and view them like a real art gallery. This represented my first attempt at integrating the traditional 2D web with 3D technologies. Partly due to the real-life emotions contained in my art gallery, and also because of the region's strategic location between three other significant sims, Baie de l'Amore holds a special place in the local myths and legends of the islands. Baie de l'Amore is a very popular technical sailing bay due to its submerged causeways and reefs, and a crashed airliner in one of the deep troughs is a delight for divers to explore over 100 breeds of tropical fish and sharks. Baie de l'Amore is also a major terminus along the Trans Irukandji Causeway, which exits the region west into Grand Irukandji, north into Convict Island, and west into Nouvelle Kiribas. Much of the roadway is permanently underwater throughout the sim, making it traversable only by 4WD or amphib. The Maskari River passes through the western edge of Baie de l'Amore and in the north forks to join with the Odin River that travels through Valkyrie Shoals and the north of Irukandji. Regions neighbouring Baie de l'Amore, clockwise from south, are Tamita Island, Tamita Bay, Nouvelle Kiribas, Valkyrie Shoals, Convict Island, Tongabuti Bay, Grand Irukandji, and Minoan Atolls. 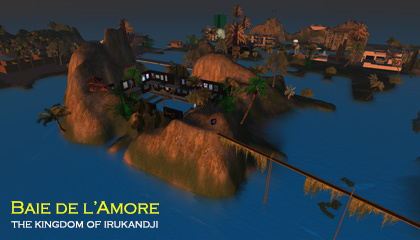 The concept and layout of Baie de l'Amorewas very popular, and I would go on to use its terrain file as the template for more than 20 future sims. 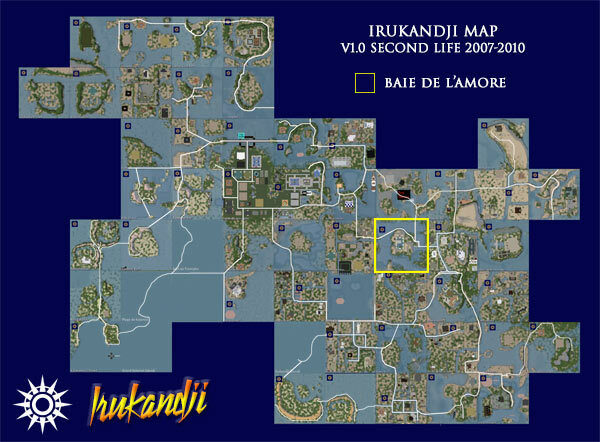 Towards the end of the life of Irukandji v1 on Second Life, I began to downsize the estate. Briefly towards the end, I relocated the Kalamat Naval Base to the lee of the central mountain. 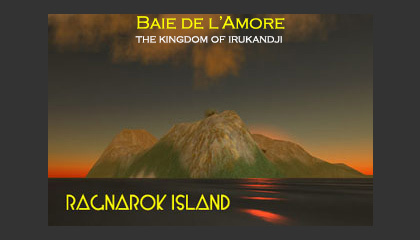 In 2013, when I created Irukandji v2 on the InWorldz virtual world, I also created a new version of Baie de l'Amore which, except for the art gallery, was based on the old. Unfortunately, photographs from that era are rare, but a few of Baie de l'Amore do survive below.